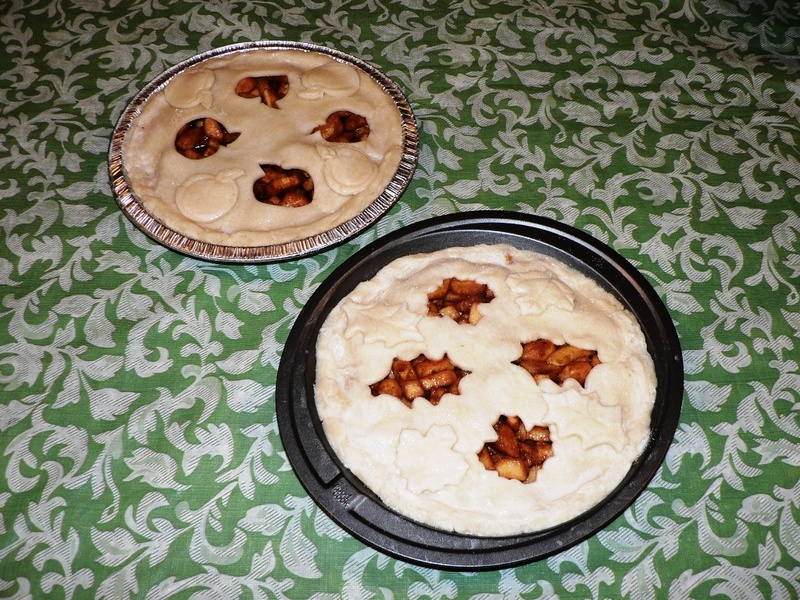 The most North American dessert I can think of: Apple pie. This was a real challenge as well because I made the dough myself. I’ve seen the pre-made shells at the store but I feel like it’s not genuine if I don’t make it myself. I don’t even use cake mixes (except for buttermilk pancakes, I should look for a good recipe). Shortly after moving to Canada I was wise enough to buy a pie pan and thanks to my mother-in-law I got some additional throw out ones. The recipe I used comes from the “Canadian Cook Book” edition 1977. The explanation is rather lengthy and I will try to keep it short. They make it sound very difficult too but I thought it wasn’t too big a deal. 1. Sift flour and salt together. Cut cold fat into flour, each piece being the size of a pea. 2. Sprinkle cold water over the flour. Mix the flour up from the bottom of the bowl with a fork. Press lumpy pieces to the side and sprinkle dry flour with water again. 3. Shape a ball but do not knead, break the ball in half. If it crumbles more water is needed. 4. Wrap and chill until needed, if stored longer let the dough warm up before using. 5. Roll out on a clean, slightly dusted surface between two pieces of wax paper or on a pastry cloth. 6. Lightness of touch while rolling out is important. Make sure the dough does not stick to surface or rolling pin. 7. Thickness should be 0.5 cm. Roll it loosely around your rolling pin and place in your pan. 8. 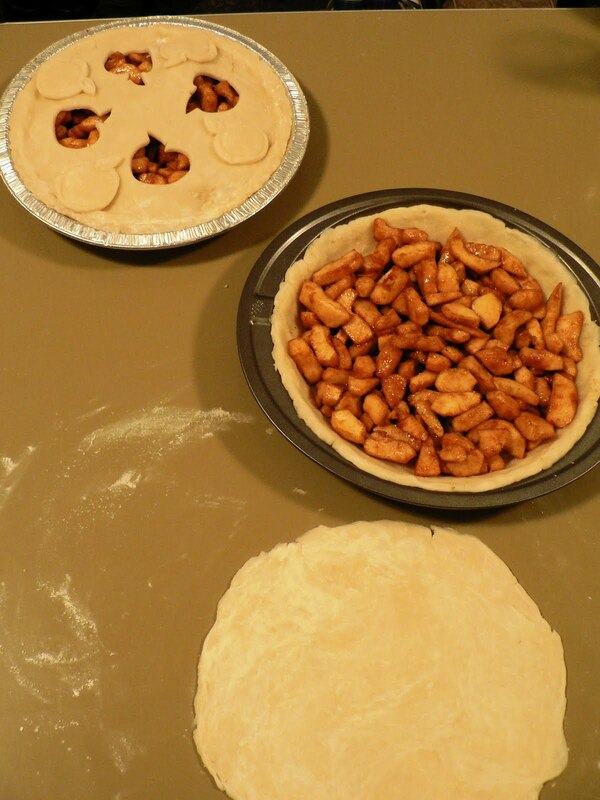 Roll out top layer, either decorate by cutting shapes or make lattice top. 9. Dampen the edge of the bottom layer, place top layer on top and lightly press together. 10. Make sure steam can vent and bake until lightly brown at 180°C. Mix all together, fill in non-baked pie shell and bake at 180°C for about 40 min or until lightly brown. Makes one fantastic Apple Pie. 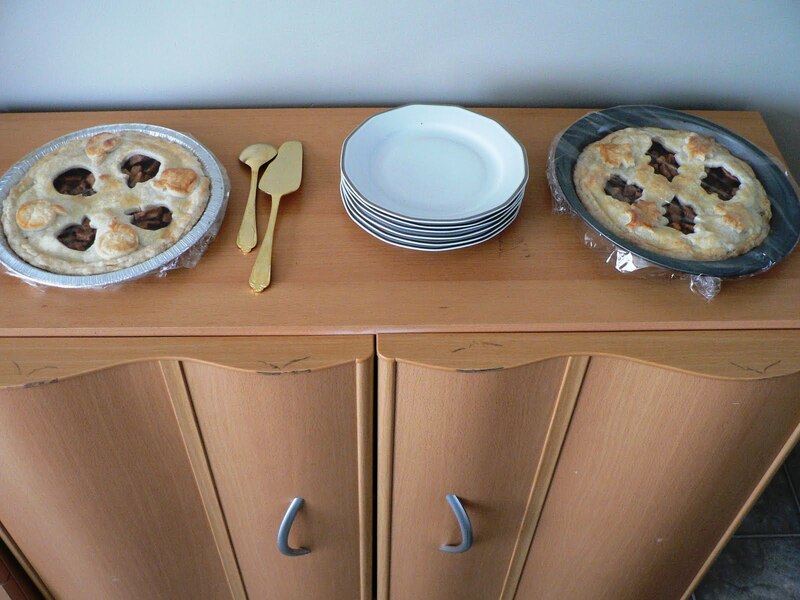 Posted in Pies and tagged apples, baking, pie, recipe. Bookmark the permalink.